The inline four-cylinder engine series M271 appeared in 2002. 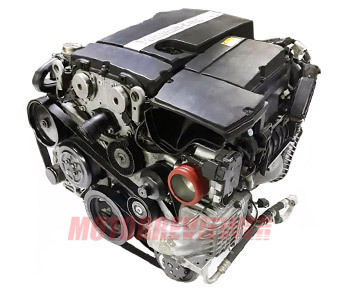 The new generation engine has utterly new cylinder block, which cats from aluminum alloy with cast iron sleeves. There is a balancing mechanism inside the cylinder block. The M271 cylinder head is also made from aluminum; it has two camshafts, four valves per cylinder and hydraulic lifters. The engine has variable valve timing system on both camshafts. The M271 1.8L engine has two types of cylinder heads for KE and DE versions (indirect injection and direct injection fuel system). Also, KE and DE pistons are different. The diameter of the intake valve is 30.5 mm, exhaust - 27 mm. Connecting rods are from M111 EVO. The engine has a timing chain and small supercharger Eaton M65 (Kompressor). In 2009, the M271 series was upgraded, and the main feature of these engines became the turbocharger IHI Al 0065/0066 instead of the supercharger. Also, the engine control system was changed to Siemens SIM4 LDE. The broad power range of M271 1.8 liter engine allowed to replace all M111 series engines. M271 series has 1.6-liter engine version also. The next four-cylinder family the M274/M270 appeared in 2011 and started the replacement of M271 series actively. 1. Power loss. That is one of the most common problems with the M271, which caused by soot on valve stems. 2. Engine noise during fired-up. The engine had an unreliable single-stand timing chain and stretched chain produces a lot of noise. M271.820 (2009 - present day) - EVO modification. Compression ratio is 9.3, power - 184 hp, torque - 199 ft lb. This motor was designed for Mercedes-Benz C 200 BlueEFFICIENCY W204, SLK 200 BlueEFFICIENCY R172, E 200 BlueEFFICIENCY W212, E 200 Coupe BlueEFFICIENCY C207. M271.860 (2009 - present day) - another EVO modification with 202 hp and 228 ft lb of torque. This motor is for Mercedes-Benz C 250 BlueEFFICIENCY W204, SLK 250 BlueEFFICIENCY R172, E 250 BlueEFFICIENCY W212, E 250 Coupe BlueEFFICIENCY C207.